The Big Four of Ma Long, Zhang Jike, Xu Xin and Fan Zhendong had mixed results on the opening day of trials, Friday 3rd March, for the Liebherr 2017 World Championships. Once the floodgates opened and the crowd settled in their seats, the Marvellous 12 took the stage and began the long journey to the Liebherr 2017 World Championships. The spotlight was on Ma Long, but the glare may have got to the world number one. Early on in the first game against Yan An, Ma was having problems with the LED table. Too bright? With a pair of shades out of the question, Liu Guoliang left the commentary box, headed down to the court and immediately told Ma to resume the match. Liu probably felt his player should have dealt better with the situation. In preparation for Rio Olympics the Chinese team practised facing such distractions. At times during practice games they would use a flashing light or swing a towel around to distract the player. They would even go so far as to call a let after a point was won, just to get on the athlete’s nerves. Too cruel? Today the training proved its worth. In spite of the lights, Ma Long didn’t blink and comfortably took the match two-nil. Some would say Zhang Jike is reason enough to be watching these trials. 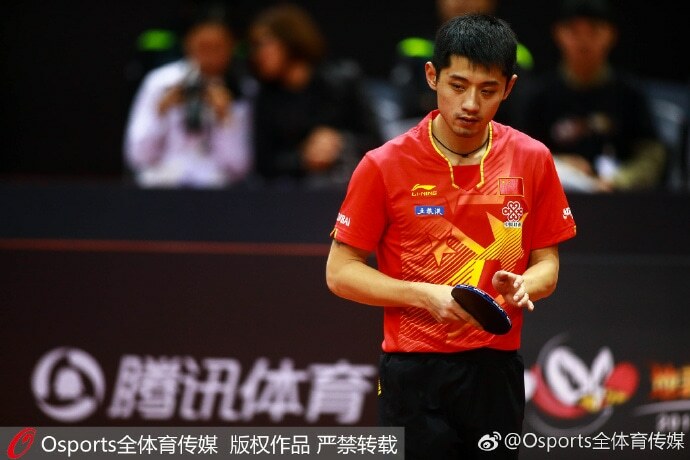 It’s been nearly six months since seeing him in action, and a fever that kept him out of action at the Qatar Open means we still haven’t fully got our Zhang Jike fix. But it wasn’t to be a fairytale comeback for Zhang when he faced Liu Dingshuo. Liu was aggressive, making long reverse serves and looking to pivot. It was a high risk yet high reward tactic. Liu took the match 12-10 in the third. Who wouldn’t enjoy taking down a Grand Slam champion? Zhang was philosophical in defeat. Meanwhile Fan Zhendong, who topped last month’s qualification event, lost to Lin Gaoyuan. It was a surprise defeat after Lin finished ninth at last month’s qualifications. With Xu Xin surviving a full distance match against Zhou Qihao, the Big Four were left with two wins and two losses on the first day of qualifications. In the women’s half, Ding Ning, Liu Shiwen and Zhu Yuling all posted wins in their opening encounters. Day two commences at 13:05 (GMT+8) local time, so be sure to catch the action live on the ITTF Facebook page. Checkout the full results from Day One below.